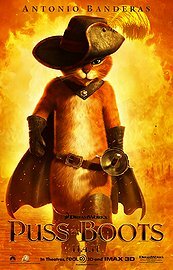 Long before he even met Shrek, the notorious fighter, lover and outlaw Puss in Boots becomes a hero when he sets off on an adventure with the tough and street smart Kitty Softpaws and the mastermind Humpty Dumpty to save his town. This is the true story of The Cat, The Myth, The Legend. Great animation ,Dreamworks studio at its best. Antonio Banderas was perfect as the voice of Puss in Boots. Lots of funny moments for the kids to enjoy. There was an unnecessarily long “dance off” scene that really added nothing to the plot. Puss in Boots: Fear me if you dare! Humpy Dumpty: You got any idea what they do to eggs in prison? I’ll tell you this. It ain’t over easy. Jill: Is it true a cat always land on its feet? If you are a fan of the Shrek movies you will enjoy this one. I would have preferred the spin-off to be about Donkey , but i guess Puss in Boots has a more interesting back story . It had some silly humor but thats what you expect from a kids movie. Its a nice family movie for the holiday season. #3.Mtopo fimo fimo. This is a kids movie just came out last month. You must live in a bubble it has been all over American Media. My 5 year old son loved it. Just wait for the DVD to come out right now it is sill in big screen !